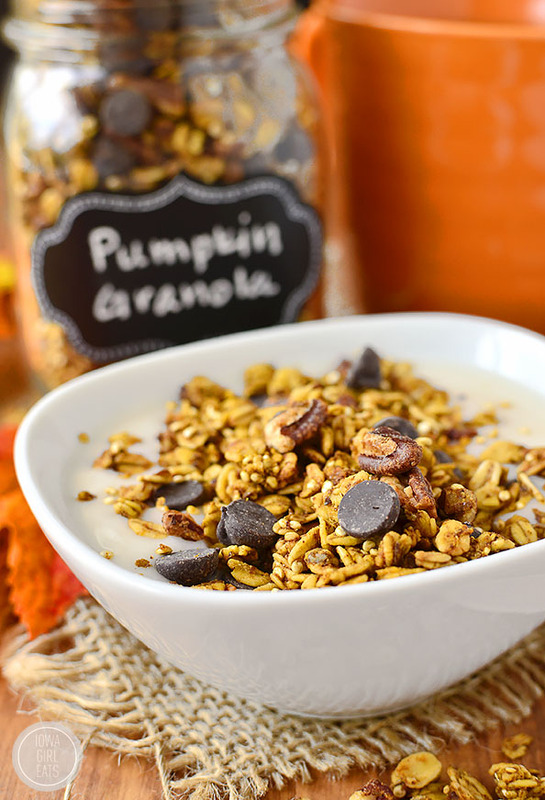 Pumpkin Spice Chocolate Granola is just sweet enough and spiced with the unmistakable flavors of fall, with a hint of dark chocolate. Gluten-free and naturally sweetened, too! (Natural) sugar, spice(s), and everything nice (like dark chocolate, YUM!) – that’s what Pumpkin Spice Chocolate Granola is made of! Anyway, personally I can’t get into the pumpkin spice flavored drinks on the market because they’re not Celiac-friendly (cross contamination – it’s a beeotch!) but pumpkin spice stuff at home? ALL about it. I need to recreate these Pumpkin Pancakes with a GF pancake mix ASAP, but in the meantime I’m ringing in this lovely season of pumpkin and warming spices like cinnamon, nutmeg and cloves with this entirely too easy to inhale Pumpkin Spice Chocolate Granola which is not only gluten-free, but dairy-free, and naturally sweetened, too. Plus, it’s vegan. 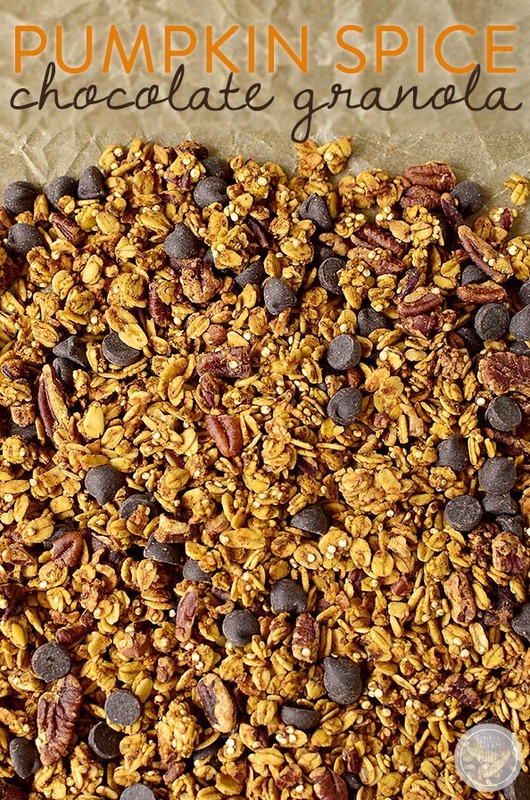 Fall-flavored granola for literally everyone! If you’ve never tried the combination of chocolate and pumpkin, get excited because the flavors are made for each other. Like Mariska Hargitay and Taylor Swift’s Bad Blood video – you wouldn’t immediately put the two of them together, but once you experience it there’s no turning back. Like I said this granola is really crunchy on account of the quinoa which crisps as it cools, and is lightly sweetened with warming maple syrup. I mean I just. LOVE IT! 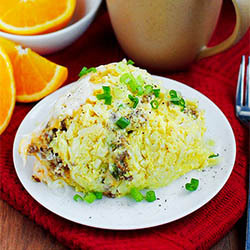 There’s really only two steps to this recipe – stir stuff together in a bowl then bake it! Said stuff includes 3 cups certified gluten-free old fashioned oats (if you need it,) 1/2 cup rinsed quinoa, 3/4 cup chopped pecans, 2 Tablespoons ground flax seed meal (optional,) and pumpkin pie-inspired spices including cinnamon, ground ginger, ground cloves, and ground nutmeg…plus a little salt. Mix everything together in a large bowl. 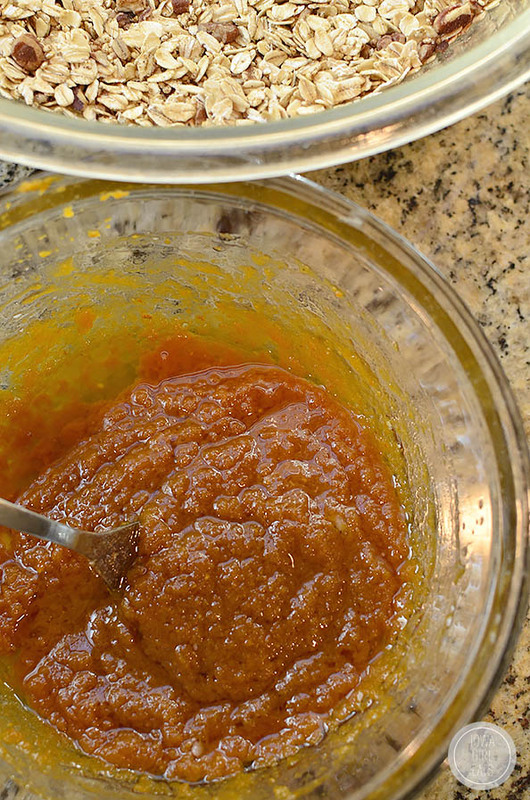 In another bowl whisk together 1/2 cup pumpkin puree (not pumpkin pie filling,) 1/2 cup pure maple syrup (not pancake syrup,) 1/4 cup melted coconut oil, and 2 teaspoons vanilla. Add the wet ingredients to the dry, stir very well to coat, and then spread the mixture onto a silpat or parchment paper-lined baking sheet. Bake at 325 degrees until the oats and pecans are golden brown, 25-30 minutes, stirring every five minutes. The granola will crisp as it cools so don’t worry about the texture – you just want to make sure you don’t burn the nuts! After the granola is completely cool, stir in 1/2 cup dark chocolate chips. I absolutely love these Enjoy Life chips (usually found in the health food section of the regular grocery store,) which are free of many allergens including dairy and wheat, but taste amazing. I’ve never really found a dark chocolate I enjoy until I tried this brand. Let’s talk packaging! You could store the granola in a bowl on your countertop so you can snag handfuls of it every time you step foot in the kitchen (aka me, who has been looking for reasons to go in there even more often than usual because I know this stuff is waiting for me,) OR you could package it in a nice mason jar, and even give it as a gift. Who wouldn’t love to be on the receiving end of this perfectly sweet and spiced delivery? 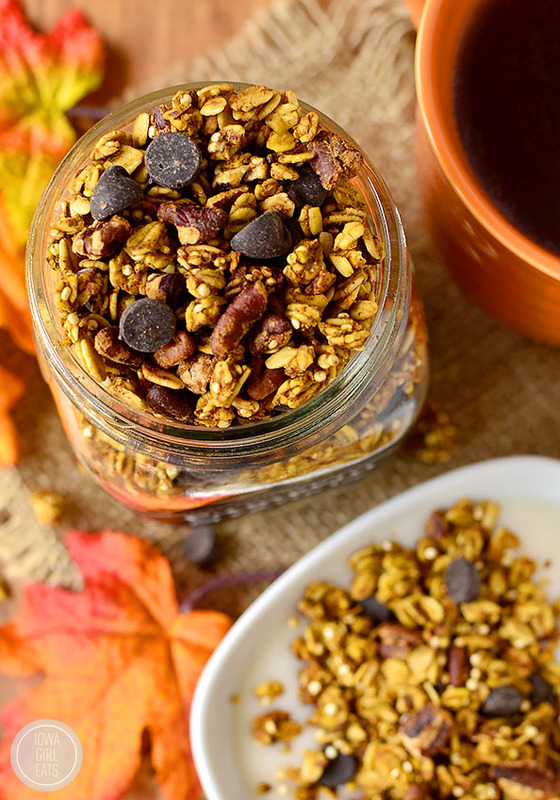 Pumpkin Spice Chocolate Granola is just sweet enough and spiced with the unmistakable flavors of fall, with a hint of dark chocolate. Gluten-free and refined-sugar-free, too! Preheat oven to 325 degrees then line a large baking sheet with a silpat or parchment paper. 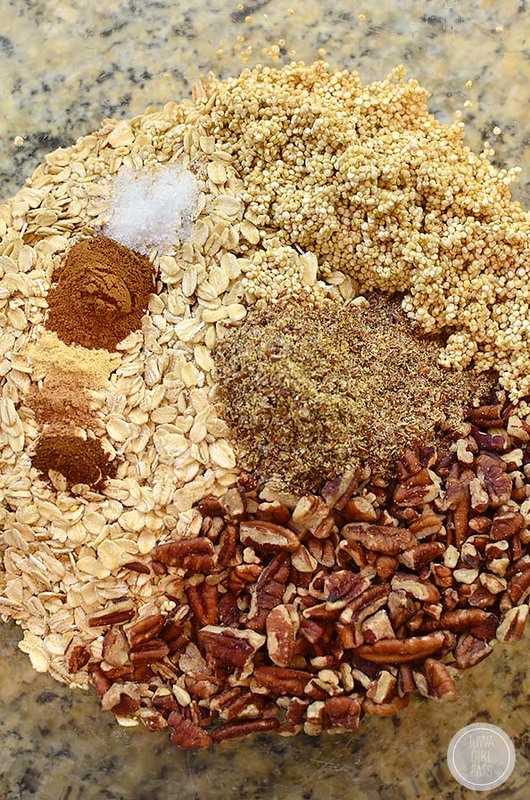 Combine oats, quinoa, pecans, ground flax seed meal, spices and salt in a large bowl then stir to combine. In a separate bowl stir together remaining ingredients, except chocolate chips. Pour into dry ingredients then mix very well to coat. 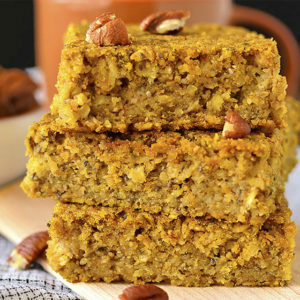 Pour mixture onto prepared baking sheet then bake until nuts and oats are golden brown, 25-30 minutes, stirring every 5 minutes. Granola will crisp as it cools. 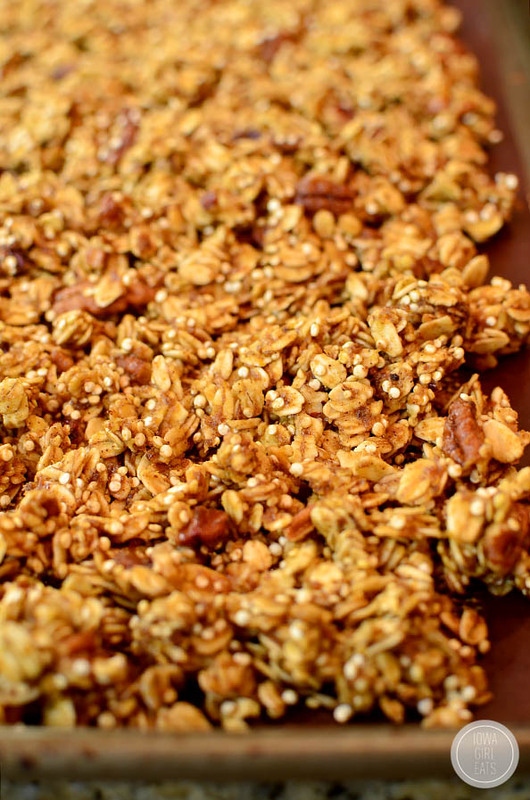 Cool granola completely on baking sheet then stir in chocolate chips. Store granola in an airtight container at room temperature for 4-5 days. This granola will stay nice and crunchy in an airtight container for up to 5 days and I think it gets better every single day. 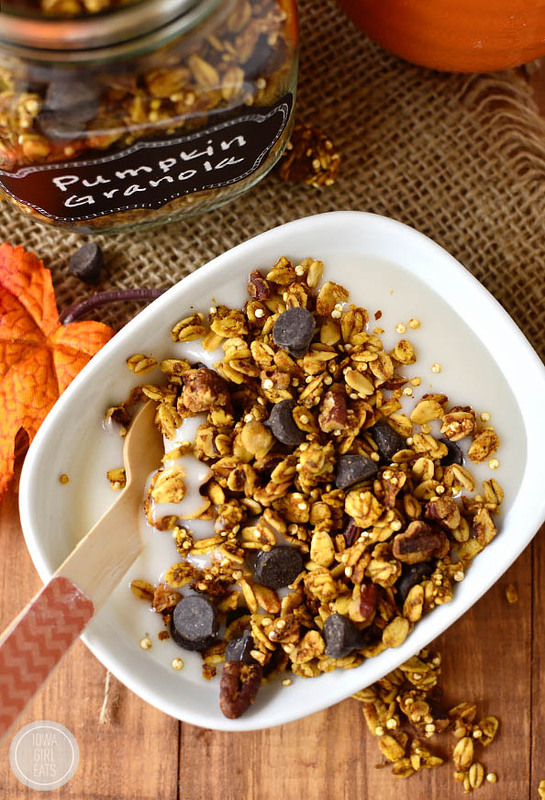 Enjoy both this granola, and pumpkin spice season while it lasts! uncooked quinoa in granola used to freak me out, but i tried it recently and was pleasantly surprised. and though i was trying to hold onto summer, i’m finally getting around to accepting fall and spices and pumpkin (sigh). This looks so delicious! I’m such a huge fan of granola and especially when it includes chocolate! I love it! This recipe looks perfect for fall. I’m with you on almond milk, I wish more cafes would offer it as an option. I visit Argo Tea for that reason! You bet, Brittany – I hope you both love it! Oh no! I didn’t know that PS had gluten in it! How did you find that out?! On a positive note, this looks delish, thanks! 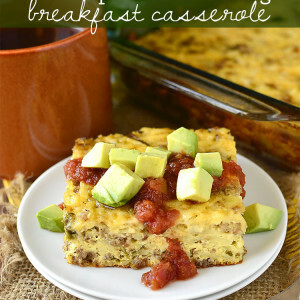 I am new to this gluten free living… I am SO making this for my fam! 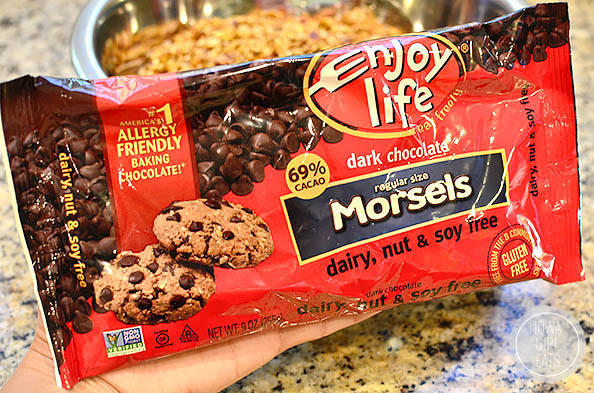 Love the recipe, but its inaccurate to say “no refined sugar” when you use enjoy life choc chips, which are lovely but made with cane sugar or brown sugar depending on the kind. Oh my gosh, you’re right, Samara! I was just talking about the granola itself, but completely forgot about the chocolate chip add in, which is made with unsweetened chocolate and cane sugar. Thanks for the heads up! Any estimates on how much pumpkin spice to use if not GF? I tallied 2.5 tsp from what you’ve got above, but I don’t know if it translates that easily. This looks simple and delicious to make. Luckily I believe I have everything in my cupboard RIGHT NOW to make this! My boyfriend and friends will LOVE this! Can’t wait to make it! What a great idea to add quinoa to granola. I will need to make this, my pumpkin spice craving is strong! Can’t wait! I’m ashamed to admit that I didn’t try the pumpkin chocolate combo until just a few years ago. Man was I missing out! Like you said, I haven’t turned back since. Moral of the story, I NEED this granola in my life! Do you really need to stir it every 5 minutes? That seems like a lot! When you say stir it do you mean just shake the pan a little or take it out of the oven and mix it up with a spoon? I take it out of the oven and mix with a spatula on the baking sheet. It only comes out to about 5 times or so. You could probably get away with stirring every 7 minutes – I just get paranoid about burning the granola. There is nothing worse! 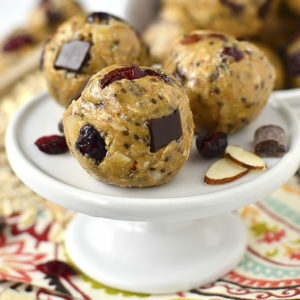 Oh yummy I must try making these! Kristin, this sounds fabulous! I’m a selective eater (not picky – ha! ), and I’ve just started eating yogurt after years of being disgusted by it. 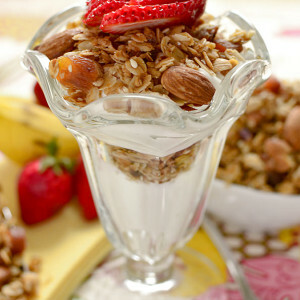 I’ve been using granola yogurt toppers, and this granola would be wonderful with vanilla yogurt. Thanks for the recipe! This is going on my fall baking list – pronto! Can’t wait to have this as a snack! Oh, ya .. gonna make this!!! So I made this tonight and followed the directions to a “t” (leaving out the flax) and mine never dried out. Any thoughts on what went wrong? Oh no! I’d keep baking it a little longer! I put it back in for another 4 rounds of 5 min each and it finally dried out. I don’t know why it took so much longer! Hi Patti! I was really paranoid that I’d typed in the wrong ingredient amounts after reading your comment so I got up this morning and tested two more batches, and they both crisped up. I’m thinking maybe the pumpkin puree you used might have been more “wet” than mine (I used Libby’s) or maybe you could try baking the granola longer. The granola won’t reach it’s full crisp potentially until it’s completely cool, too. I hope this helps – I thought about you all night! Oh my goodness you are much too sweet. It seemed ok this morning when I packaged it up. You make a good point about the pumpkin though – I used a store brand. I’ll keep it in mind for the next time I make (because I know there will be a next time). My son is allergic to coconut, what could I use to replace the coconut oil? I would try vegetable oil! This looks so good! What a great idea to change up my breakfast routine! Especially for fall! Give me all of this granola! I love those Enjoy Life chips. I couldn’t have soy or dairy while nursing my son and this brand was a life saver! Sorry about that – was fixing something up this morning and it got messed up! Amount should be 1/2 cup. Thanks for the heads up! This looks yummy! I make a batch of granola pretty much every week, and this looks like the perfect one to make this week. I’m not GF myself, so I haven’t researched it thoroughly re: cross-contamination risks, but I saw that Trader Joe’s has a GF Pumpkin Pancake mix if you wanted a quick pancake fix!! 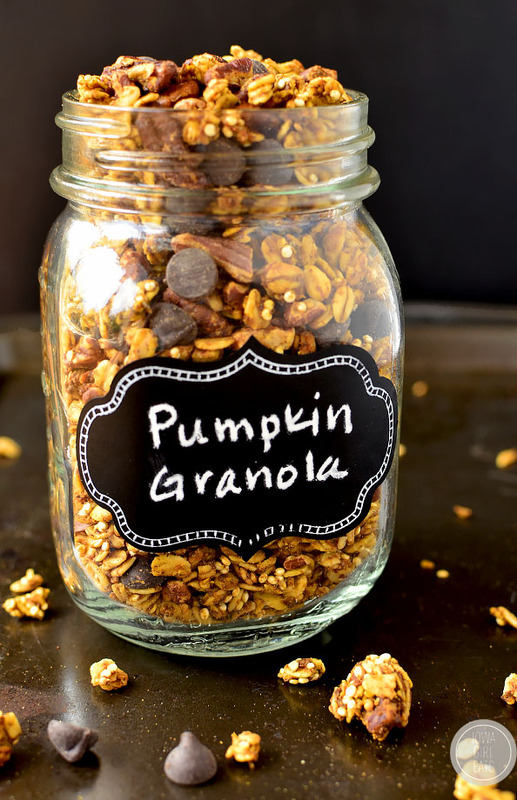 I LOVE anything that has pumpkin in it and granola is a favourite of mine, genius to combine the two! I’m so making this recipe this fall! :-D Pinning it! I made a double batch this afternoon and it didn’t dry out. I’ going to wait until tomorrow morning before I stick it back in the oven. Unfortunately I already sprinkled on the chocolate chips which I will have to remove. I used half pecans and half pepitas which gave a nice color. Next time. I’m going to add chocolate covered cranberries. Aside from the texture it takes delicious and it smelled heavenly. I’m going to make it work. So sorry to hear that, Sarah! I think the double batch would take several more rounds. Let me know how they turn out!! This is my first try at homemade granola. So excited to taste it. I used fresh pumpkin puree. I made this yesterday for my kids and shared some with my husband. It’s become part of our daily ritual for breakfast! Soo, glad to hear, Mariana! Love that the kids are getting into it too! My granola came out soggy :o( I was exact with the pumpkin, oil, and other liquids. The flavor is great – and not too sweet for my husband. I don’t like that it is soggy, though. I baked it at the 325 temp for 30 minutes. I used an 11 x 13 pan w/ a silpat. I was unable to get a thin layer in the pan. It was thick. Could that be the reason why it didn’t firm up and stick together? Any suggestions? It’s in the fridge now. Hi Chris! I would keep baking until it has dried out a bit. 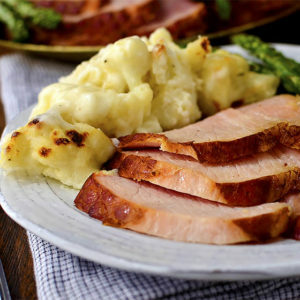 Ovens can vary – especially if you are cooking with a convection oven or not – so the timing is more of a guideline and I’d recommend baking until golden brown vs a specific period of time. I hope this helps and I’m so glad you like the flavor!! My husband picked up pancake maple syrup and not the pure stuff. We’d like to try using that since the pure maple syrup is so expensive. Should I use less or is there something else you’d recommend? Hi Susan! I can’t be sure what the final product would end up tasting like, but I’d start with a little less then taste the granola before baking, and then add more if it’s not sweet enough! This looks great. Maple syrup is so dang expensive. Is its only purpose for sweetness? I don’t want to sub in pancake syrup. I might try it with 2 T instead. Planning to make it again this week but want to know if there’s anything to do different so that it will turn out crunchy instead of chewy like.